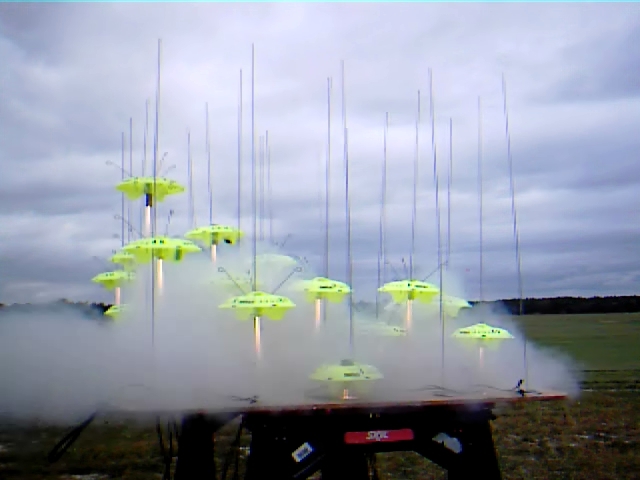 The SouthEast Alabama Rocketry Society (SEARS) is a National Association of Rocketry Section serving Southeast Alabama, Northwest Florida and Southwest Georgia. We are also associated with Tripoli Rocketry Association Prefect 38. See Introducing SEARS. Our website is www.sears572.com. The highlight of the day was a mass launch of about twenty Estes Snitch rockets. We called it the Snitch Mass Invasion. See the video. SEARS supported this years Webelos Rocket Rally near Elberta, AL. There were 38 participants. Each Webelo made two individual launches. SEARS flew several demo rockets including an 4 inch AMRAAM on an I211 motor. We also setup the mass launcher. There were twenty Starhawks in the mass launch. This is a very enjoyable event at the skydiving center. Richard Gean has invited us back for next year. 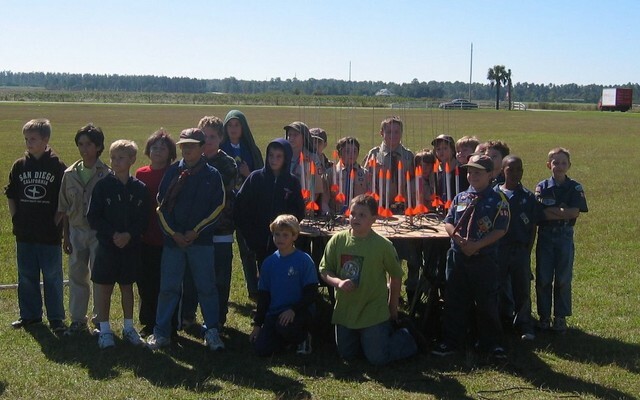 There were a number of webelos that remembered last years launch. 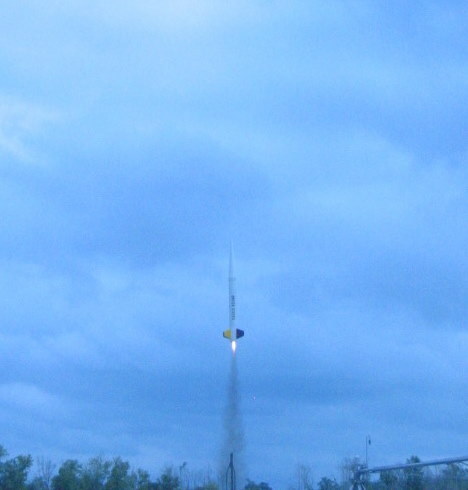 The first SEARS Tripoli research launch was held on the afternoon of Oct 21st 2007 at Samson, AL. Kendall Brent did a static burn of a sugar motor and launched several rockets with sugar motors. See Kendall’s report below for the details. We also had some commercial motor launches. Chris Short brought a friend Halley from Auburn. Chris and Halley are members of this years Student Launch Initiative. John Hansel, Greg Lane and Chris Crews also attended. All flights were successful except for one CATO. The pictures are available here and the videos are here. Click thru the slideshow below of the static burn of a sugar motor in a three inch PVC casing. Thanks to Chris for setting up the research launch and Kendall for showing us his motors. I came with 5 research motors, 4 to fly and one for a hole in the ground static test. There were 3 KNSO sugar motors. Two of these were singal use PVC with remachines aerotech nozzels. Big sugar is a 3 inch PVC motor useing a 54mm aerotech nozzel bored out to 9/16. The singel fuel grain was cast as a 1/2 by 1 1/2 C slot in a 9 inch 3 inch coupler. The total grain weighed 2.75 pounds. This motor was static tested and burned as expected. The other PVC motor was made from 1.25 PVC useing a remachine 29 mm aerotech nozzel bored out to .25 inch. The singel fuel grain was a C slot cast in a 5 inch 38mm liner tube with a .125 by .75 slot. This motor power a flight with a PerfectFlite timer for recovery. The other Sugar motor was a 3 Bates grain in 54mm Loki case. This motor suffered a CATO soon after ingition(see video) . Cause of CATO is expected to be either inhibitor failure or cracking of the grains at ignition. A 4 grain 38mm CPAP (Tiger Tales) was used to take my Firestorm 54 to 2900 ft. The final motor was a research Hybrid which failed to fill. The cause of the failure turned out to be a defective Press to connect fitting in the motor. SEARS Tripoli Research Launch is a GO! The first SEARS Tripoli Research Launch will be Oct 21st in Samson. The waiver will open at 1 PM. See more info on research launches here. October 17th, 2007 at 2:42 pm If you have any questions please call me at 850-554-6531. This will be a very slow paced launch and there is likely to be less than a dozen flights. Please fell free to come out and watch but understand that spectators are not allowed onto the range for any reason. Lets make this a great first research launch. There will be a controller and a rail for HPR. If your are Tripoli L2 or above you can fly commercial. Greg is going to bring his low/mid power launch pads and controller. You are welcome to print out the SEARS Tri-fold Brochure for your friends and outreach contacts. SEARS will be supporting the Webelos Rocket Rally on October 27th at Emerald Coast Skydiving in Elberta, AL. Here is a map to 16646 County Road 95, Elberta, AL 36530. We will provide a rocketry demo and setup the mass launcher for their rockets. Cliff and I plan to go. If others want to help out let me know. Last year SEARS supported the Rocket Ralley event. It is well organized by Richard Gean the Esca-Rosa Cub Scout Roundtable Commissioner. Here are the pictures from last year. We got a chance to see the skydivers after the event. We had a overcast day in Samson, AL with steady 8-10 mph winds. Our event was Odd Rock Day. Cliff Oliver of Panama City won the event with his Spook Rocket. Our special feature was the Snitch Invasion Mass Launch. I believe we had 21 Estes Snitch rockets on the pad and all but one flew. John Hansel had an interesting launch of his Nike Smoke on a Contrail M Hybrid. He expected 3000 feet and only got 600 feet. There will be some analysis on why it under performed. See more pictures and the videos. Thanks for a great day! A special thanks to the Panama City group who make the trip and contributed to the Snitch Invasion! The next launch is Nov 3rd. and the event is Scratch Rocket Day. Fly any Scratch Rocket on a green flight card and you have a chance to win a prize. 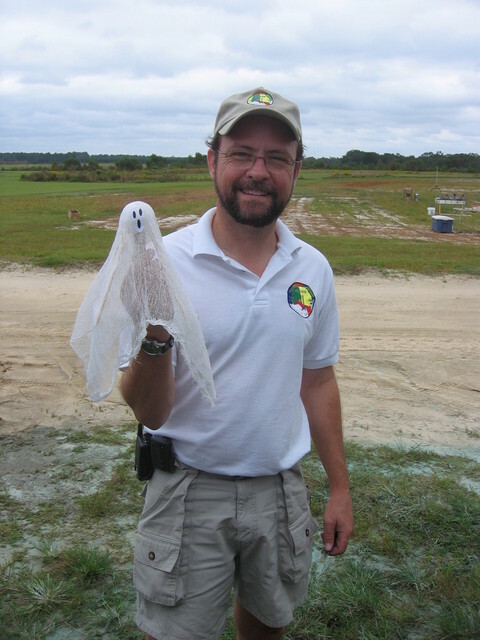 You are currently browsing the SouthEast Alabama Rocketry Society weblog archives for October, 2007.